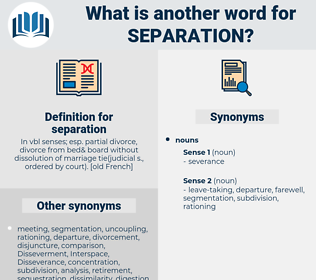 What is another word for separation? segregation, dissociation, disconnection, disengagement, fragmentation, disassociation, secession, segmentation, isolation, sequestration, estrangement, subdivision. points, Separating, beginnings, separated, distance, spacer, barrier. Placentae, Separating, compartmentalization, disintegration, divide, delineation, end-of-service, secessionist, disconnect, dislocation, remoteness, dismissal, delimitation, alienation, splitter, distribution, incompatibility, divisiveness, difference, independence, scission, exclusion, categorisation, deregistration, demobilization, compartmentalisation, radiation, allocation, Disaggregation, distance, isolating, demobilisation, break, separability, cancellation, sorting, disruption, septation, distinctiveness, spacer, rupture, dichotomy, confinement, de-coupling, schism, distinguishing, insulation, expulsion, apportionment, triage, splittist, sortation, dispersion, quarantine, barrier, inconsistency, pullout, graduation. distinction, differentiation, decoupling, Separatism, demarcation, parting, divorce, divestiture, attrition, buffer, breakdown, distinctness, spacing. association, closing, juncture, union, agreement, greeting, attachment, connection, hello, closure, togetherness, marriage, combination. It saved Joan the painful thought of permanent separation. It was great happiness to them to be together after their long separation. spartium, suspiration, spare time, spartina, subroutine, spartan, suppuration, suppertime. 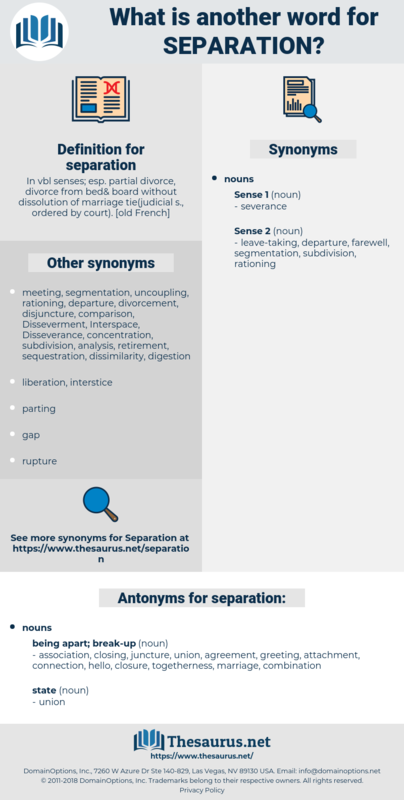 partition, seclusion, disjunction, divergence, detachment, threshing, division, remotion, Separatism, isolation, divorce, secession, disengagement, separationism, disunion, avulsion, disconnection, partitioning, withdrawal, segmentation, sequestration, sectionalisation, divorcement, sifting, segregation, winnowing, closing off, tear, sectionalization, divergency, removal, dissociation, winnow. disjunction, discreteness, disconnection, disassociation, discontinuity, distinctness, isolation, disjuncture, disconnectedness, severalty, separateness. group action, sorting, change of integrity. result, termination, resultant, final result, outcome.